It’s Not Just About HOW You Pray Or Worship… Right? I know this may not be the wisest thing to say at this time, but let me vent. Just a little, please. The truth is, no matter how objective the BOOM (Board of Ordained Ministry in the United Methodist Church) wants to be, it’s really difficult to take out your personal bias or preference while reading a candidate’s paper or interviewing a candidate. (Just like with anything in life. It’s hard for us to be completely objective). And I’d be completely okay with that, if they admit it. But that’s a different story. Worship, apparently seems to be a sticking point with me and the BOOM. Both years that I applied for full membership, they had something to say about the worship service I recorded. They had some valid points about the theology of worship, but they seem to have a bigger concern with the kind of worship that was taking place. What that had to do with worship was beyond me. I explained to him that when I first got to that setting, I did wear a suit and tie every Sunday. It wasn’t until the church members started “complaining” that I was too formal. The congregation, along with the senior pastor, suggested and urged that I dress like everyone else, a bit more casual. (When I moved from that church, they gave me a stole made out of denim so that I can still feel casual when ever I have to robe up). That statement reflects preference of worship more than theology of worship, doesn’t it? Or is it just me? But I remember feeling my blood pressure rise. I had to summon everything that was within me to hold my tongue. In fact, I actually bit my tongue so that I wouldn’t say anything stupid or damning. I already knew that I totally screwed up my previous interview section, so I didn’t want to mess up this interview section. Here’s what I wanted to say: Does it matter how we worship? Can we dictate how someone should respond to God’s presence and blessing in their lives? If the worship is God centered and focus, if the worshippers heart is coming from the right place, is there really a wrong or right way to worship? 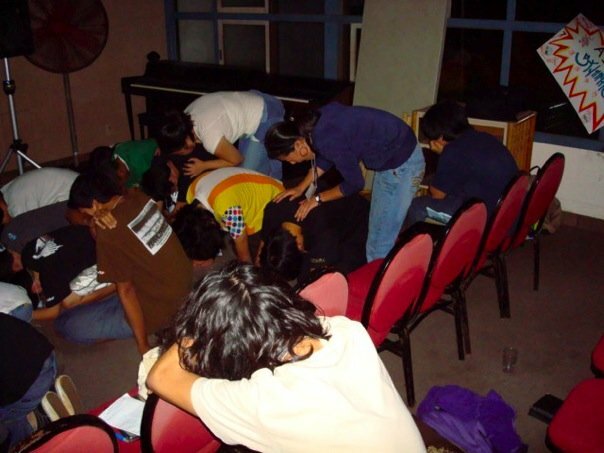 The picture in the beginning of this post is of my youth from Hawaii praying and getting prayed over during a winter retreat. The video following is a clip from a Korean church’s dawn prayer service, where they are engaging in 통성기도 (tongsong kido). That’s the kind of prayer life I grew up with. My father is a prayer warrior. My dad took everything to prayer. Late at night, he’d go to church to pray by himself. Early in the morning, he would go to church to pray. Sometimes he would be gone hours at a time. But prayer was not enough. He engaged in fasting. He did 4 40 day fasts in his life. His appearance after 40 days will always be engrained in my mind. His calves were as thick as my forearms. He engaged in many 20 day fasts. If you added all the days my father fasted in his lifetime, it’ll add up to more than 365 days. That kind of fervor and attitude is prevalent in the Korean Christian culture. Well, maybe not the way my dad fasted. But fasting and fervent prayer is part of our culture as Christians (and something that I miss being part of). So when someone says “prayer warrior”, whether it’s fair or not, there’s a comparison to the “prayer warriors” I’ve been surrounded by all my life. People (and a few pastors) have often shared that they don’t have time to pray. So they pray at red lights in traffic. If I were to say, “That’s not prayer!” It wouldn’t be very pastoral of me. But, I feel that’s what the BOOM has basically said to me in the past two years regarding worship. Of course, there’s always more we can do. That’s a given. We can always pray more. I can encourage someone to try to find another time of the day to pray on top of the red lights, like while washing dishes. And pray a short prayer first thing in the morning. Say a prayer before you go to bed. Say a prayer while you’re commuting. Offer a short prayer while at work. There’s always something more you can do. And the more you seek God, the more of a priority it becomes in your life. So find every opportunity to be in prayer, and eventually your day will revolve around your prayer time, not the other way around. Not: you call that prayer? It’s so fluffy. Who am I to judge how someone connects with God? Who am I to say to a person who has no idea of how Korean Christians pray, s/he is not engaging in the type of prayer that I call “prayer”? So, then, who is to say that the type of worship that shaped me, the type of worship that I feel most connected to with God, is “fluffy”? Or too casual? Or not enough, even? Why do we, as churches or pastors, try to monopolize worship? Worship can take place outside of a church building. And it should! Worship can happen without a choir or an organ. In fact, worship can occur without any music or musicians or choir directors or church music divas. Worship can happen without robes and stoles. Parents, do you care how your kids express their love and gratitude for you? Or does it make your day when they say, “Mom, Dad, you guys are awesome. I love you guys.” as their dressed in their PJs about to the drift off into sleep? I mean, do we have to recreate our wedding day every time we express our love to our spouses? In all honesty, I believe that these “worship wars” is more about me and you than it is about God. The style of worship is our preference, not God’s. What kind of worship do you think God prefers? But I can’t say for sure. But it’s how I like to think God reacts. I do hope that the BOOM will be able to be more objective, and I believe that they can. Or at least admit that they come in with certain ideas and expectations for clergy and understand clergy comes in all shapes, sizes, theologies, philosophies and beliefs. For a denomination that values diversity, I have to say that during the ordination process, being too different from BOOM members’ theology, philosophy and belief is a very, very, very uncomfortable place to be. I found it to be much easier to try to figure out what the BOOM expects of a clergy rather than being the pastor God is calling me to be. But more importantly, I just hope that we won’t try to keep putting God and connecting and responding to God in a box, as we all are accustom to doing. I absolutely believe that worshiping God as a church is vital. I think corporate worship is beautiful and a necessity in our faith journey. But, I also believe that we can’t limit worship to just corporate worship. God is with us every second of our lives, not just during the time we’re sitting in pews. Worship needs to happen corporately. But worship also needs to happen outside of the walls of the church. And really… is there a wrong way to connect and respond to God…?